It’s meant to be a simple demonstration. For years, quantum cryptographer Kerek Reidier has been developing teleportation technology in his top-secret, DARPA-funded lab, and he’s already performed dozens of successful trials. Some people see teleportation as the ultimate weapon; to others, it’s the gateway to immortality. But The Reidier Test changes everything. The last thing we see in the recovered security footage from Reidier’s lab? A physicist, his wife and their two boys, tessellating for a fraction of a nanosecond, before the entire facility and everyone inside vanishes. 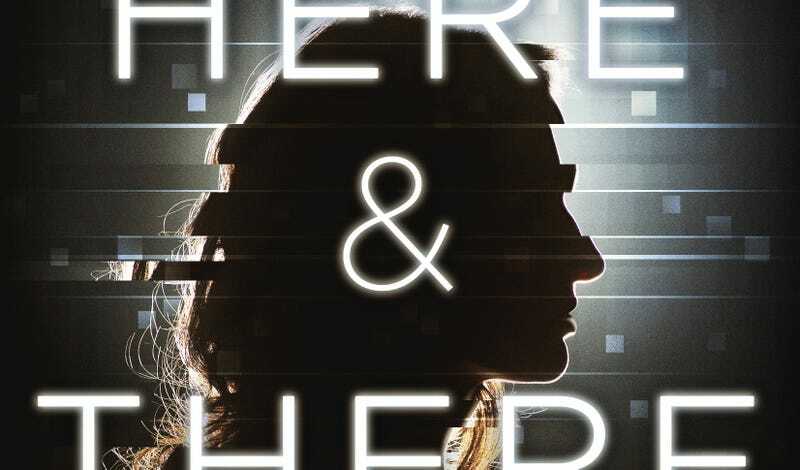 That’s the catastrophic opening to Here and There, a new tech thriller by Joshua Scher that takes readers on a quest for enlightenment through layers of quantum encryption, nanotech spyware, and duplicitous government agents. This is a tough book to get into because of its unconventional structure, but for people who do take the plunge, an incredible payoff awaits. Criminal psychologist Hilary Kahn gets hired by the US government to figure out what exactly went down on the fateful day of The Reidier Test. But during the course of investigating, Kahn herself disappears without a trace. Several year later, her son Danny Brand discovers a suitcase filled with annotated video transcripts, redacted documents, and email correspondences from his mother’s final investigation. Desperate to find closure to his own personal tragedy, Danny abandons his mundane job at an ad agency in New York and goes undercover. He soon finds himself as hopelessly ensnared in the Reidier mystery as his mother was before him. Anyone interested in quantum physics, data encryption and advanced computing will relish Here and There’s deep meditations on these topics. Reidier, who conducted groundbreaking work in the field of quantum cryptography before turning his attention to another subatomic matter—deconstructing and re-constructing physical objects across space—is everybody’s teacher, deftly drawing narrators and readers alike into his world of quarks, qubits, and entanglement. After reading transcripts from Reidier’s lectures on the physics of science fiction, one can’t help but feel that the quantum basis for teleportation isn’t so mysterious, after all. The much bigger mystery lies in Reidier’s personal life; a family tragedy which drives the physicist obsessively forward in his work. After he’s scouted by DARPA and relocated from Chicago to Providence—his wife Eve is given a visiting professorship in Comparative Literature at Brown, he’s offered virtually endless resources to devote to his teleportation research—everything seems picture-perfect for the Reidier family. But as the video transcripts from their heavily bugged McMansion reveal, that couldn’t be further from the truth. Just before the move, Eve has suffered some sort of emotional breakdown, and the husband and wife’s relationship remains deeply strained. Then there’s the matter of their son Ecco, who is anything but a normal child, especially when compared with his twin brother Otto. Unusually clever and intuitive but unable to form emotional connections or parse the rules of the world around him, Ecco seems almost phantasmagorical, an apparition of a boy rather than the real thing. Somehow, Reidier’s work is responsible for both Eve and Ecco’s state. But pressing forward with his research seems to be the only way to set things right. The hardest part about this book is its structure: the story jumps erratically between timelines, narrators, and media in a way that’s constantly pulling the reader out of the moment—often, just as we’re on the brink of an groundbreaking insight. There’s also the ending, which, rather than tying the story neatly together, is a minefield of revelations that call the entire 600-page investigation into question. I have to admit, I went through several stages of grief after reading this book, from denial (this can’t be it! ), to anger (how the hell can this be it?!) to eventual acceptance. What’s the true narrative? Is Here and There the ramblings of a psychotic person, a clever work of fiction, or an actual censored report? It’s up to us, the readers, to draw our own conclusions. If you like characters with clear motivations and stories that unfold linearly, this is not the book for you. But if you, like Danny and Hilary, are just crazy enough to dive into a mystery as ensnaring as quantum entanglement, I think you’ll find the reward well worth the effort.